Just last Friday Bluesfest Touring announced that Courtney Barnett would be the special guest at Patti Smith’s Australian performance in Melbourne. So much happening at Bluesfest and one thing for sure - there aint no stopping now! Patti Smith and Her Band have announced that Bluesfest 2017 will be their last Australian festival performances, making them all the more special. The announcement comes just days after Bluesfest Touring added a final concert to Patti Smith’s touring roster, where her special guest will be Courtney Barnett. We are thrilled to announce that Courtney Barnett will also be playing at the festival on Thursday 13 April. Barnett is a Melbourne-based singer, guitarist and songwriter who has built a growing legion of local devotees through a series of DIY releases on her own label Milk! Records and now it seems the rest of the world has embraced her – having sold out her most recent tours to rapturous audiences in the UK and USA. Her special guest spot at Festival Hall and Bluesfest set are Barnett’s only scheduled shows for 2017. Courtney Barnett joins the huge line-up on Thursday including Patti Smith, Corinne Bailey Rae, Mavis Staples, Nikki Hill, Rhiannon Giddens, Joan Osborne, Melody Angel, Irish Mythen ... but hold it, these are all the ladies, what about all the gentlemen? Aha! Also bringing their musical gifts to the stage on Thursday are Trombone Shorty & Orleans Avenue, St. Paul & The Broken Bones, Gallant, Devon Allman, Trevor Hall, Davy Knowles, Mud Morganfield , The California Honeydrops , The Suffers (who also have one beautiful front female singer in their band), Dupstaphunk, The Strumbellas (who also have one stunning female on the violin), Blind Boy Paxton and the The Mountain Goats. Oh boy, it’s going to be one hell of an opening night at Bluesfest Thursday 13th of April. As you all know, the five day Easter extravaganza that is Bluesfest will be held once again at its lush 120 hectare home, just outside Byron Bay from Thursday 13th of April to Monday 17th of April. Bluesfest delivers up to 12 hours of music daily across multiple undercover stages, as well as offering an abundance of food and market stalls, several bars, parking and camping on site. It’s the only place to be at Easter! In true Bluesfest fashion, there will be more exciting artist announcements in the coming weeks. Ticket update - 80 days till Bluesfest! We are now barely holding on to the 3 day Fri/Sat/Sun Ticket which will be taken off sale in next to no time. Adding Courtney Barnett to the huge Thursday line-up, will spike ticket sales so please be on alert, that the allocation of Thursday, Friday and Sunday single day tickets are diminishing day by day as well. After all, Bluesfest is now only 80 days away. It’s an honour to be presenting Patti Smith and Her Band's final festival appearances in Australia, as a part of their final tour here. At Bluesfest, on Easter Thursday she will perform the album Horses, and will then do an acoustic set on Good Friday in the afternoon. Patti personally requested Courtney Barnett to be her special guest in her final ever show in Australia at Melbourne's Festival Hall, just a few days after the festival. 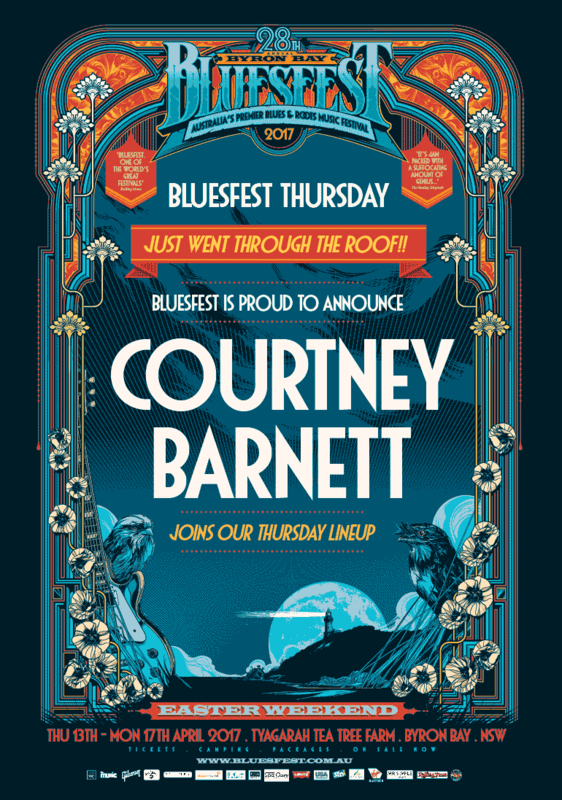 And now, we are thrilled to announce that Courtney will play before Patti on Easter Thursday at Bluesfest. These are the only two scheduled shows for Courtney in 2017. Courtney, who has said that Patti Smith is amongst her greatest influences, kindly agreed to Patti Smith’s request, and oh boy, are we excited to be bringing you this announcement. Bluesfest is a Handmade event, crafted slowly and lovingly. We take our time and take great pride in what we bring to our stages. We are not finished yet.... and you will be hearing more from us soon. Every year at Bluesfest is a little different, and this year certainly is. We hope you like where I am taking the event. It will ALWAYS be about the music. Bluesfest Touring alert: Patti Smith, Courtney Barnett and more are selling fast + more tours to be announced soon! 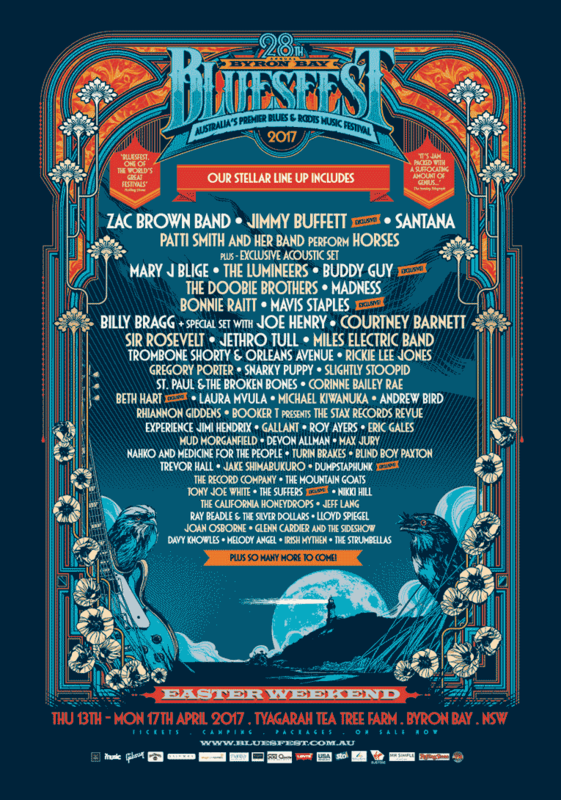 Tickets for Patti Smith and Courtney Barnett are flying out the door so if you want to experience the magic of Bluesfest at one of those shows buy your tickets now. If you aren't lucky enough to make the trip to Byron Bay this Easter, we are bringing Bluesfest to Sydney, Melbourne, Perth, Cairns and Canberra! With more tours to be announced in the next few weeks, keep your eyes on the Bluesfest Touring Facebook page and if you haven’t already sign up to our e-newsletter to be the first to hear about tours and get presale links before the general public.